Charles Fox was born in 1887 at Preston Plucknett, the son of agricultural labourer Henry Fox (b1842) and Jane Ellen née Tompkins (b1852). Henry and Jane frequently moved around as evidenced by the birth places of their five children; Minnie (b1878, Hillfield, Dorset), Henry George (b1879, Hillfield, Dorset), Beatrice (b1883, Yetminster, Dorset), Charles and Frederick (b1889, Preston Plucknett). Charles Fox was a professional soldier and was a Private in 2nd Battalion, Somerset Light Infantry. His Service Number 7417 indicates that he enlisted in the autumn of 1904 when he was aged 17. 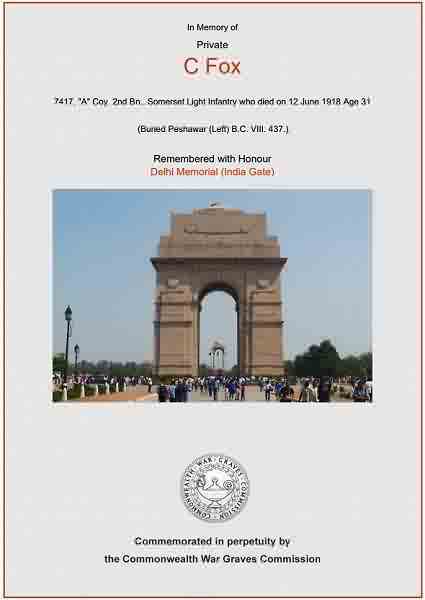 At this time the 2nd Battalion was stationed at home while the 1st Battalion served in India. In 1908 the two battalions rotated and as the 1st Battalion returned to England for home duty, the 2nd Battalion departed for Malta, where it remained until 1911. The 1911 census recorded Charles Fox as a single 24-year old soldier stationed in the Rhondda, Glamorgan, with 35 of his company - presumably just after returning from their station in Malta. Later in 1911 the 2nd Battalion was posted to China, where they served until 1913. From China the battalion moved to India. The 2nd Battalion was stationed in Quetta, India. It remained in India throughout the Great War. From 1914 until 1917 the battalion formed part of the 1st Quetta Infantry Brigade, commanded by Brigadier General Sitwell, as part of the 4th (Quetta) Division. In 1917 the battalion was transferred to the 1st (Peshawar) Division. The Division remained in India for local defence, but was mobilised for action on the North West Frontier on several occasions. Although we don't know the circumstances, Charles Fox died on 12 June 1918 - probably from disease. He was 31 years old. Charles was buried at Peshawar, India, Grave Viii.437 and he is commemorated on the Delhi Memorial (India Gate), Delhi, India. His name is inscribed in the County of Somerset Book of Remembrance, page 121, in St Martin's Chapel, Wells Cathedral and his name is also recorded on the Preston Plucknett War Memorial. The Commonwealth War Graves Commission certificate in memory of Charles Fox.